After purchasing a Swiffer Sweeper I realized that the cost of the additional sweeper cloths along with throwing the old ones out all of the time may be convenient but not cost effective. Realizing that there are sweepers on the market that come with cover that can be washed and re-used got me thinking. There is a free pattern available for knitting and crochet to make a mop cover that can be washed a used over again. Making more than one and keeping a spare on hand can also prevent being without a cover when one gets dirty. Using cotton yarn the cover is easy to make. Use a good color for picking up dirt such as lighter multi color yarn. Cotton yarn is suggested for the patter. The yarn washes well and will not harm word or laminate floors. 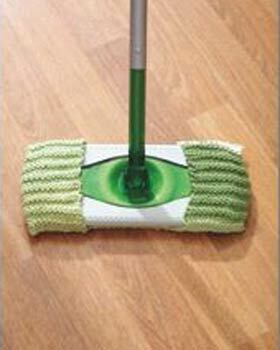 The mop cover can be used with a light spray that is made for wood or laminate floors. One of the best things about the pattern is that once the cover is made you can save money and beeco-friendly at the same time by re-using the mop cover over and over again until it is time tocrochet or knit a new one. To view the pattern or download it for free check out the article or the free pattern available below. The Swiffer cloths can get expensive and plus they are just make more trash for our garbage cans. One way to save money and help out the environment is to make your own re-usable Swiffer Sweeper cloths . Here are a few ideas and tutorials and patterns to knit, crochet, and sew your own patterns. Besides using cotton yarn to knit or crochet you can use flannel cloth, jogging fleece, recycle old towels, t-shirts, cloth diapers, baby blankets and other items and cut them down to size for your sweeper. Once you use them rinse them off and throw them in the laundry. Crochet or knit an economical reusable cover for your flap mop, sweeper, or duster. The cover easily slips off for cleaning. Download the FREE Knitting Pattern for the Cover Here. Get creative and and think of your own patterns and please share them with us!